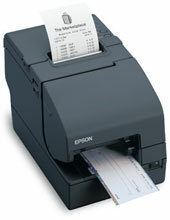 The Epson TM-H2000 dual-function printer is a new class of multifunction printer featuring high-speed receipt printing and check processing all in a small, cost-effective unit. And it has the quality and reliability you'd expect in an Epson printer. The TM-H2000 is ENERGY STAR qualified. It also offers print options that can reduce paper usage for receipts by over 30% by reducing white space without impacting the size and readability of the text. The TM-H2000 has the reliability you need with an MCBF of 96 million lines and all its components are designed to last the lifetime of the printer.